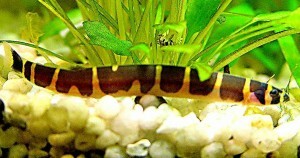 The Kuhli Loach (Pangio kuhlii) is nocturnal snake like loach that is found in Thailand, Borneo, Sarawak, Indonesia, Malaysia, Java and surrounding areas of South East Asia and are also known to tropical fish keeping enthusiasts as the Coolie loach, Prickly eye, Slimy loach, or Leopard eel. Kuhli Loaches are a social species that are found in the sandy beds of slow moving rivers and clean mountain streams. They are usually found in small clusters and although they are not schooling fish, they enjoy the company of their own species. 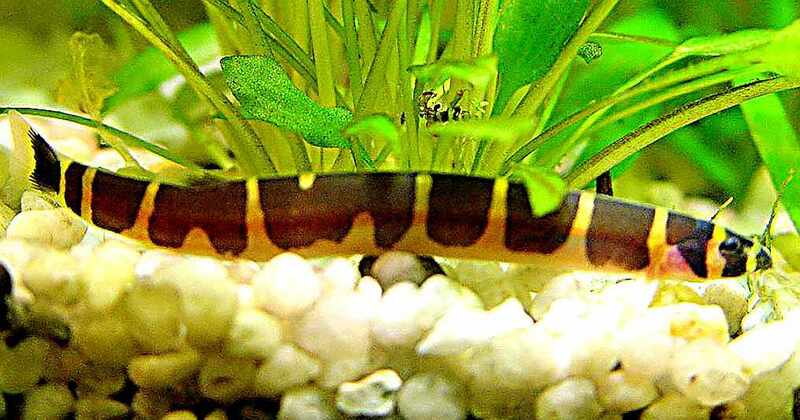 The Kuhli Loach is eel shaped with salmon pink to yellow, with 10 to 15 dark brown to black vertical bars that circle the upper half of their bodies. Their bellies are creamy white in color. They have very small eyes in the black stripe area of their body which makes them hard to detect and a mouth with 3 sets of of barbels that makes them look like they have a mustache. Their very small fins are generally translucent. When the fish is not actively breeding, the differences between males and females is not readily apparent however, the males have a more muscular upper dorsal cross section and their pectoral fins are generally larger and more paddle shaped with some pigment in them. During breeding, the females become larger than the male and immediately before spawning, their greenish colored ovaries can be seen through their skin. Kuhli loaches are peaceful and make a great community fish. They are best kept in groups of 3 or more and can be housed with a variety of species that are not large enough to make a meal of them. Although they are nocturnal scavengers, in an aquarium environment can be taught to feed during daylight hours. Kuhli Loaches prefer a densely planted tank with a sandy substrate, a few smooth river rocks and some driftwood roots for them to hide among. The enjoy burying themselves in the sandy substrate and will come out at dusk to graze on whatever uneaten food is left on the bottom of the tank. 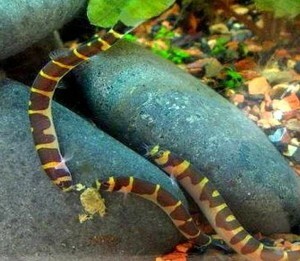 Although Kuhli Loaches can be bred in an aquarium environment, most breeding is done accidentally when a group of kuhli loaches are housed in a tank and they start breeding by themselves. Tropical fish keeping enthusiasts who try breeding them, place a bunch of them in a tank with an undergravel filter and no other fish for a few weeks. Perform regular tank maintenance and they will eventually start breeding. When breeding occurs, a few hundred greenish colored eggs will be either buried beneath the surface stuck to plant roots or laid among the roots of floating plants. Feeding Kuhli Loaches is not a problem. They are scavengers and will eat sinking food pellets, a variety of live foods and uneaten food left by their tankmates. Khulis are excellent tank cleaners.